Yesterday I was limping though airports, being irritated by no option to change out of my middle seat and feeing sorry for myself that I was inattentive to time zones and agreed to a flight that put me home after 2 am, utterly exhausted and on the verge of losing it altogether. Today I was pushing, lifting and otherwise hauling 4 chairs at once through Goodwill. I was all like get out of my way I think I see bamboo over there and I know you don’t think you’re going to beat me to it. From this photo you cannot tell how expansive the thing is nor how comfortable. It’s got the right amount of out of dateness and wear to make it unappealing to porch theives. On the way home from snagging this genuine prize package, I took a pass at Goodwill and what do you suppose I found there? 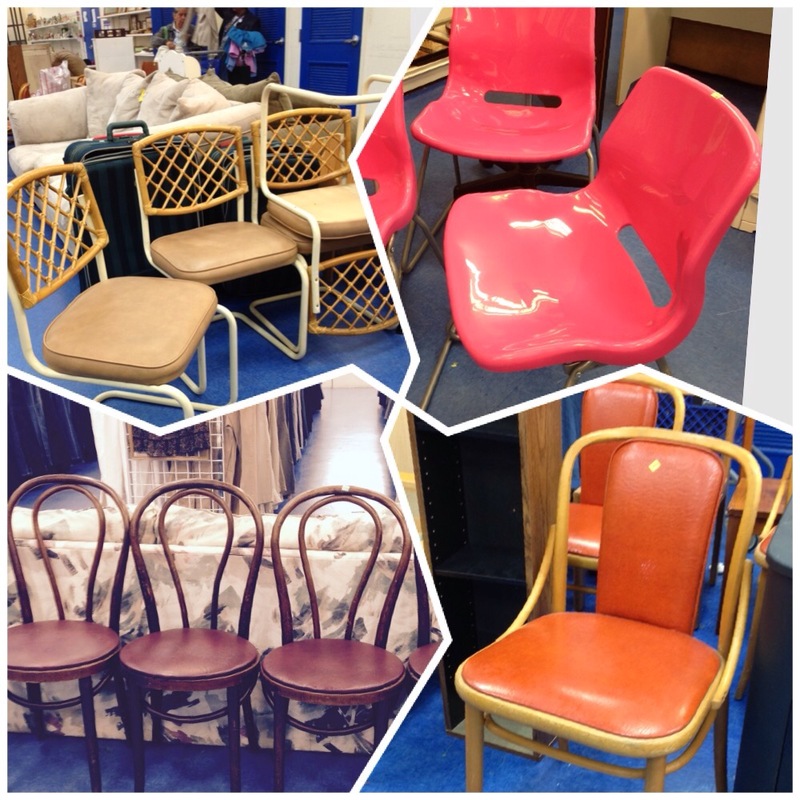 Chair a palooza! I have never seen such a rich chair selection there ever. Faithful readers, I don’t have to point out that those bamboo back chairs are of the same material and design as last week’s bamboo bistro set, do I? I grabbed 2, plus 2 of the brown bentwoods for indoor use next to a small table. Total: 4 chairs for $12.00. The daughter generally rejects the things that I like so I am so lucky that she is agreeable to letting me junk shop for her. And frankly, she is lucky to know someone who is a master junkologist. I worry that she will soon reach max capacity for my fabulous finds and Lord knows I am packed to the rafters here and cannot take on one more dish, vase or tablecloth. I tell you this not to brag or to make you feel bad about your own lack of great junk but rather to inspire you to go forth and seek out your own fabulous finds. Let me know if you need any consultations in your own pursuit of really great cast offs. The thing about porches in Philadelphia is that if you put anything out there that looks like it can be stolen and pawned, then it’s going to get stolen and pawned. And so as the people who own the random collection of serviceable but junky wood chairs are moving out of this multi-family buidling, my daughter is making plans to take over the porch decor. And so the junk hunt begins. A funny thing happened on the way to the junk. We found something fabulous. 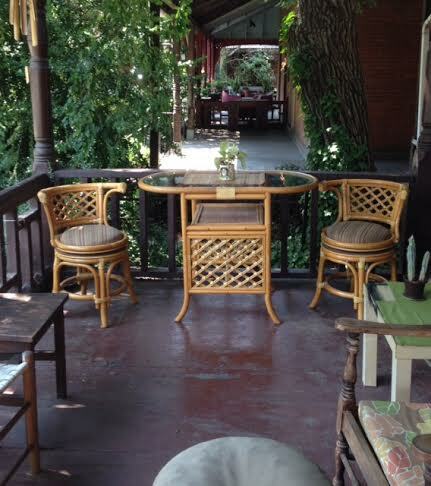 Check out this perfect bamboo bistro set we found on Craigslist … FOR $25.00! Twen tee five doll ahs. Can you believe that? Of course, compared to the serviceable but junky random chairs in the foreground, it’s highly stealable/pawnable (I guess). My daughter doesn’t seem to be too worried about it because it’s tucked back on a porch that’s a total of 10 steps above street level and rimmed by unruly shrubbery. Even so, I gifted her with a cable type bike lock to lash the table to the rail. We’re currently awaiting response from a C-lister who is selling 2 bamboo arm chairs complete with cobbled together cushion sets for $20.00 total. The chairs are a good coordinate for the bistro set but the general state of wear is more in keeping with the Philly porch decorating philosophy, which is: if you see something that looks like it should be put on a trash heap, then it’s perfect for a Philly porch. The sellers haven’t returned the message yet so I’m hoping it’s not a case of the merchandise being sold and the ad not taken down yet. In general, I’ve had really good luck buying great stuff on the cheap from Craigslist but every now and the you run into people who put stuff up for sale and then are not motivated to respond to inquiries. Like the guy with the pageant lamp – remember him? Anyway, tomorrow I hit the road for 3 trips in 3 weeks so I won’t be around to catch the good deals. I can leave Sami in charge of pursuing this one but think of the lost opportunities while I’m gone! Btw, this stuff is all listedin NJ not Philadelphia. Too many porch shoppers in Philly to find anything good on that list. Front porches in NJ wouldn’t be caught dead sporting trash heap decor. Or maybe they would. I don’t know. I live in back deck country. So Las Vegas, Denver then Baltimore and July will be shot. Don’t get excited because there’s no sequins or other glamour involved in the Vegas trip; no friends around the campfire involved in the Rocky Mountain trip but there is likely to be some excitement in Baltimore if the Freddy Gray cops don’t go to trial. Sami’s been in California since June 26th. He’s flying home on a red eye that lands at 5:30 am. I guess I must miss him because I was showered and dressed and prepared with a go cup of hot coffee when I got to the airport at 5:15am today. Except he’s coming home tomorrow. I guess I miss him. Stedman found a baby rat to toy with. I keep telling myself that it might have been a mouse, which seems more acceptable to me, but in fact it was probably an adolescent rat if size is the indicator. An old adolescent. Anyway, I was out on the deck for the customary morning inspection and he was doing his usual rolling in the grass and barking at the dog walkin’ lookyloos on the next street. When I called him to come in the house with me, for dog food nonetheless, he did not immediately appear as is his usual practice. He finally did show up and it was backing out of some bushes. When he turned himself around, he has this lovely rodent dangling limp in his mouth. I say lovely because the contrast between the medium gray fur and the pink ears, hands and tail was really quite lovely. He flipped the rat up into the air a few times then let it thunk down onto the grass. The thing was like a reverse cat toy. When he had the rodent in his mouth, he wasn’t exactly biting it as much as squeezing it between his teeth. When he let it fall, the thing would inhale with a loud EEEEEEE and the go silent again as it was picked up again to be squeezed. I left him and went inside alone because I did not want to see what happened next. Alls I know is that those chops he was licking when he finally did come in are the same ones he uses to lick my exposed arm while I sleep. So I guess after all his years of gooniness and acting stupid, he’s a real dog after all. In other news, my daughter is moving from her commune-like group house in Clark Park to her own solo apartment in a private house in Cedar Park. (This is Philadelphia Speak.) The building is an O Henry era single family residence that has been chopped into West Philly hipster apartments. It is friendly to all God’s creatures including feral cats, things that crawl and things that fly. It has enormously tall ceilings, woodwork to die for and more cracks than a whorehouse. Shelves it and even a worried mother can appreciate its charms. I guess it’s going to be okay. So ive been gathering cleaning supplies, hand-sewing cafe curtains and sitting on top of Craigslist. Craigslist is my new hobby. Not to replace e Bay in my heart but certainly to give it a run for the money. 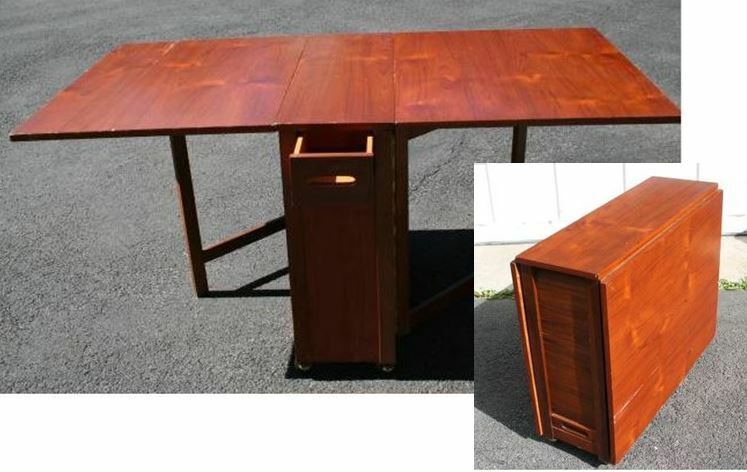 Anyway, you all know about the Made In Romania compact folding table and chairs saga … But did I mention the butcher block top kitchen cart with drop leaf that I got for nothing more than $35 and a half rank of gas? Or the unbelievably perfect Stanley rolling bar cart with expandable waterproof surface that I snagged for $40? I didn’t, I know. The butcher block top cart is common and beat up and exactly right for turning an O Henry era closet space into a contemporary hipster kitchen item, but the Stanley thing is beauty and quality and classic. She wants me to paint it orange but I cannot. I might paint it muted silver but I guess time will tell. So I guess I’ve been managing to keep busy while counting down the empty hours. I’ve been living in the past again. It would not be wrong to say that I have been immersed in it. The middle of the last century, to narrow it down. WARNING: Dreary load of words follows to tell you that I am in love with a folding chair from Romania. You might want to quit here. In early July, my daughter is moving into the first apartment where she will be living alone. Although she’s been away from home for a number of years, she’s always had a room mate. Her last location was in a very large house in Philadelphia shared with 6 other people. So there were things she didn’t need to own and things she gave away as her living circumstances changed. Now that she’s going to be living on her own, there are a few basics that she’s going to have to acquire. The apartment itself is quite roomy overall but the living room is small. Way small. So small, in fact,that when we were discussing a dining table she said she didn’t have room for one, didn’t want one and anyway she has a folding card table that she can drag out from behind something or under something if anybody comes over. Now, she loves me and she is very much like me but it is her life’s work to reject everything I like or offer up as a suggestion to her. It’s the way of the world, I know. They have to do for themselves otherwise they’ll never be able to fly on their own, but still I couldn’t let this go. It’s a 5-piece set: a 36″ x 60″ table and 4 chairs that takes up only a 12″ x 36″ footprint when folded. Have you ever seen these? I first saw this concept when I lived in Manhattan in the early 70s but I think the design is older than that. The vintage ones are all stamped MADE IN ROMANIA so maybe they went into post WWII production as part of the Marshall Plan to rebuild eastern European economy. If so, they could have been introduced to this county in the 50s. Oh, how a mother’s heart sings! She liked it. And now the hunt. First of all, these full sets appear quite regularly on Craigslist. They are mostly beat to death and/or are light colored with no visible grain pattern to speak of and/or are missing the chairs. 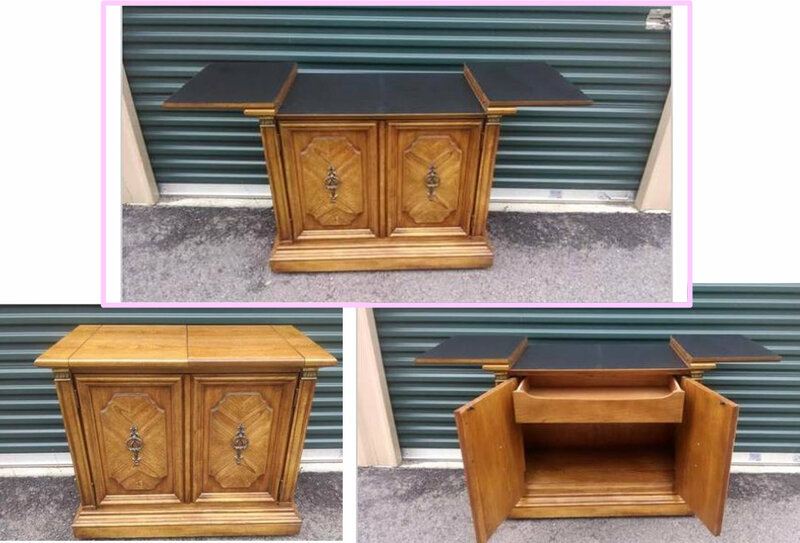 There are also some near-match drop leaf tables of the same compact design that don’t have the built-in storage space. Whether they are excellent quality vintage from Romania or poor quality later productions from parts unknown, they sell very quickly. Two weeks ago, I had a bead on a beautiful dark set with the most fabulous wood grain on the table top and I missed it by an hour. There was another one listed at the same time for $50 – light wood, boring grain but very minimal damage – that I was too late for as well. Both of those sets were active on Craigslist for about 2 days before they were sold early on the following Saturday morning. 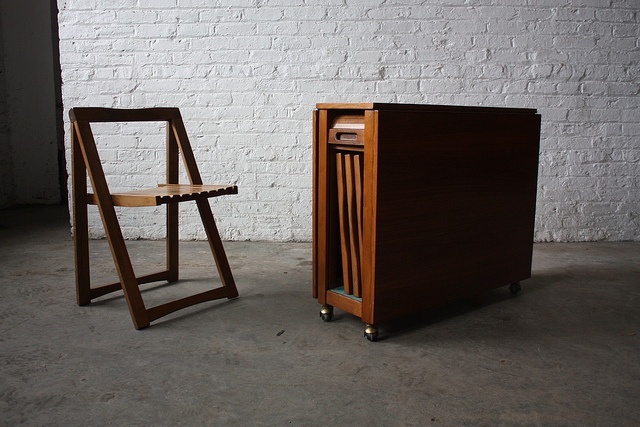 these are usually listed as “Mid-Century Modern” or “Danish Modern” and that I think attracts the attention of people who know what they’re looking for and they grab it when they see it. And I was broken hearted. The only one of my suggestions that my daughter approved and I could not provide. So, of course, I made it my mission to be sure I hunted on down and secured it as soon as possible. And that happened this weekend, but it wasn’t so easy. I’ve seen a dozen sets since then or at least the tables and they were really discouraging. More money than those first listings I saw and really, really beat-up. Lots of paint blobs and scrapes, stains, gouging and a fair amount of missing veneer at the edges were universal. And the tables themselves were the less interesting pale grainless types. Some had cheap door hinges in three places along the length of the drop leaves instead of the full-length brass piano hinges on the Romania ones. Most didn’t have the chairs because I believe that no one wanted to give up those fabulous chairs. I’ve got nothing except free time and burning ambition. But I loved it just by looking at the picture. Well, not just looking. I became adept and adjusting the lighting and enlarging the photos so I could see the details to judge if a table was worthy of trip to see it. And this one sure was. But no chairs. 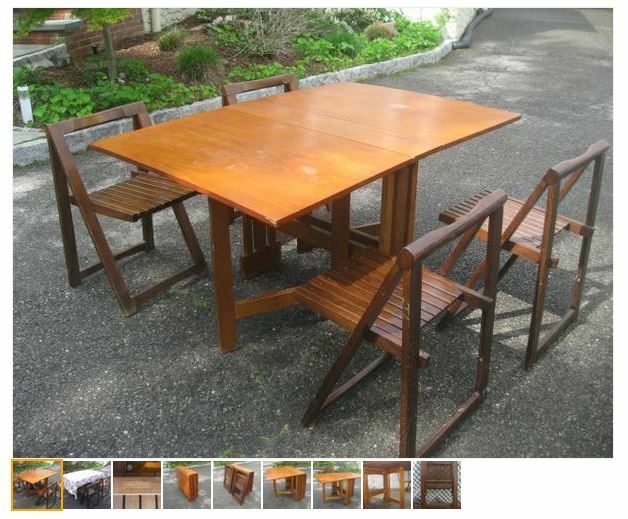 It’s the wrong kind of crappy beat up table but offered as a package with the right kind of chairs. I knew they were the right chairs because of that signature indent in the top rail of the chair backs, the clever invisible hinge were the legs meet at the top rail and the genius design that allows these to fold completely flat at only 2″ wide. So for one tank of gas, the better part of a sunny Saturday and no haggling at all, we’ve got the reunited set plus one extra crappy table. Which doesn’t look all that crappy now that we have it home. A few water marks or heat marks, and aths about it. No gouges, no veneer chips, nice overall color. I started washing off the old food and paint blobs from one of the chairs yesterday. My God these chairs! My husband is a hypercritical engineer who believes he can build everything better than whatever he’s looking at and he is positively enchanted by the design and the quality of these chairs. The feel of the chair back in your hand is a very sensual experience. The finishing is impeccable. Even the seat slats have edges that are sanded round. They move silently and smoothly – not a squeak or hitch in any of them. I can hardly wait to get intimate with the table when I start cleaning that up. All I can tell you now is that the small drawer and the bottom of the chair compartment are lined with thick green felt and that the drop leaves and both of the gate legs have heavy brass piano hinges along the full lengths. Why do people even buy new furniture when quality like this exists in the world? 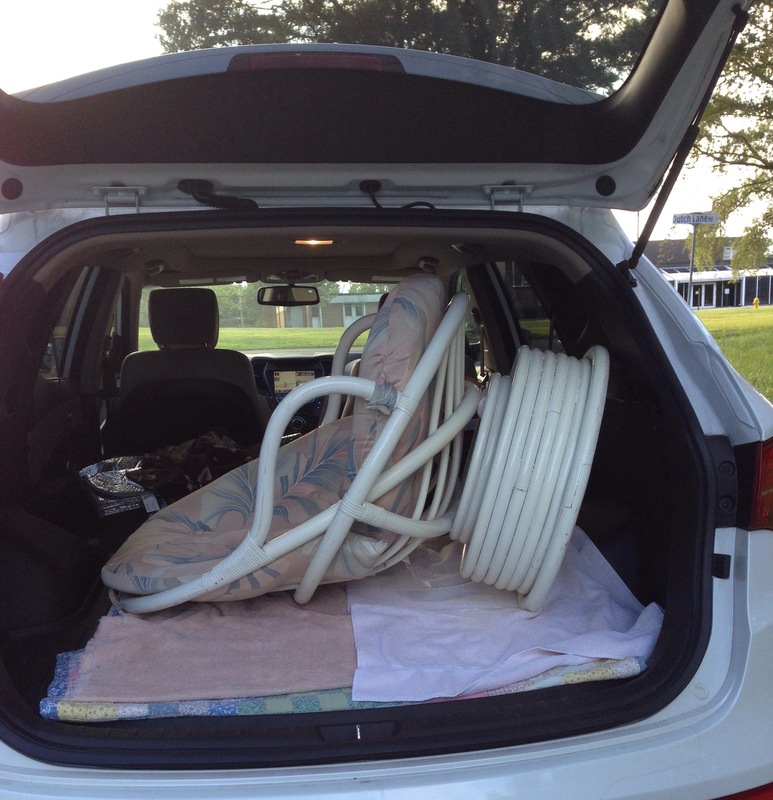 I’m headed down the Parkway this morning to see the floor lamp of the Craigslist seller who stood me up before. 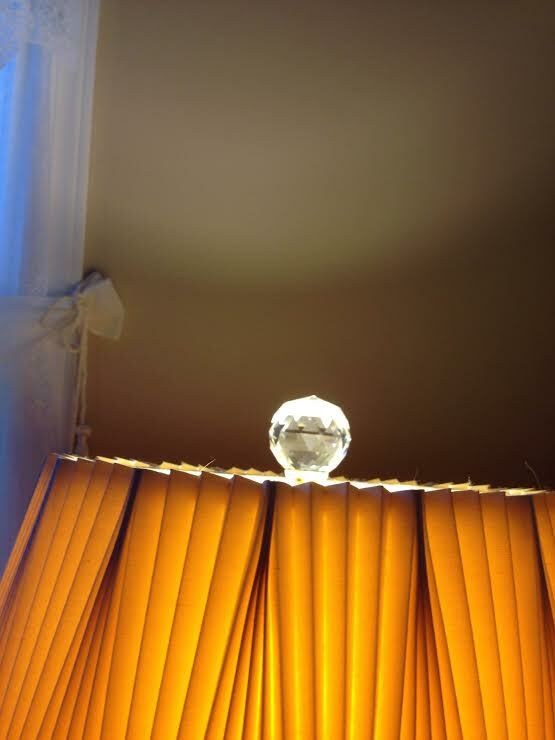 Not the pageant lamp – the other more sedate one. Which means I got up early had one cup of coffee and then showered and got otherwise ready according to an external schedule, not my usual pajamas all day and wash your hair whenever you feel like it routine. This is a real drag. How do you people do it? I do not have the feeling that I am going to come home with this lamp. With one spectacular exception, I’m conditioned to expect failure when it comes to buying used lamps. It needs a brighter light bulb and maybe a Swarovski snowflake hanging from the swing arm but here it is. Now I’m all set to fall asleep in this chair when I read. 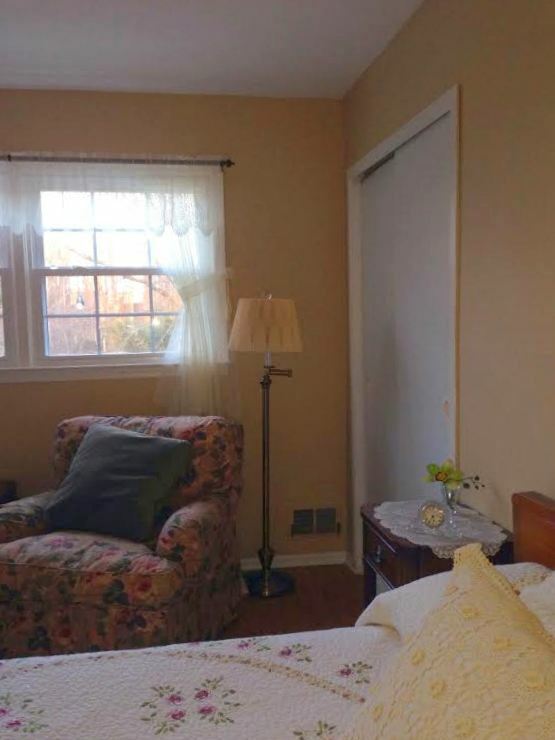 This is my Craigslist corner: nightstand, club chair and floor lamp all gently used and tasked with a second life in my lac,y rose-y bedroom. Which by the way, my children laugh at for its tackiness. This has been an exhausting experience. I’m glad it’s over with.